Unique in the world: The terrace Bramante enriched by the Restaurant and his 360° view over the Eternal City. 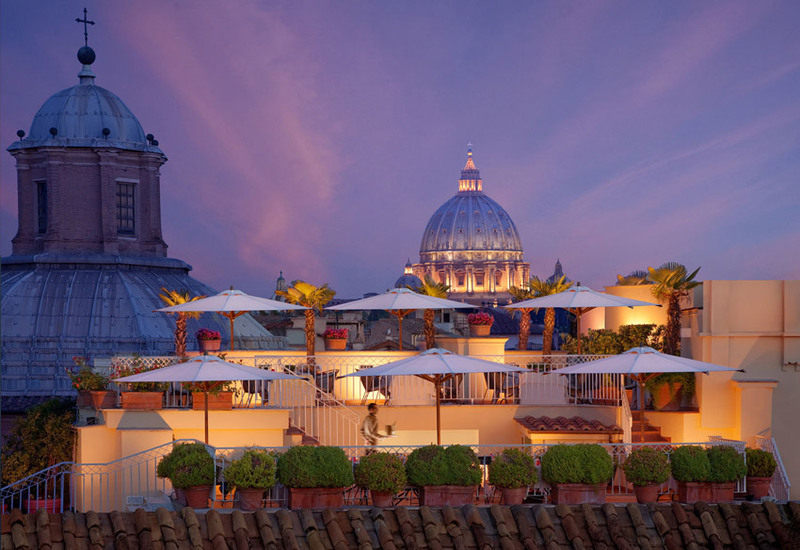 From the multi-level terrace of the Hotel you can enjoy one of the best panoramic views of the "eternal city". Among the authentic old roofs of the village stretches from St. Peter to Castel Sant'Angelo, with sinuous lines of the Tiber to the white bulk of the War Memorial in Piazza Venezia, the Pantheon in S. Louis of the French, the Palazzo del Quirinale, Piazza di Spagna and beyond. The Roof Garden, overlooking on one side, directly on that authentic masterpiece that is the Bramante Cloister of Santa Maria della Pace Second, however, stands the Church of St. Mary of the Soul, officiated by the Fathers of the German College and built in 1500 by Giacomo della Porta. The nearby Borrominiana Church of St. Agnes in Agone , Palazzo Doria Pamphilj and the Portico del Vignola confirm the historical and architectural envy location of Raphael, actually a few steps from Piazza Navona. From this privileged position, while relishing the spectacle of this old town lit by golden rays, you can sip a glass of champagne, a glass of wine or order, if the weather allows, lunch or dinner, prepared with the best Italian products, strictly seasonal and mainly organic biodynamic.